It’s been a while since I had a spare minute, so updates have been a little sparse, but believe me, good food has not. Last week kicked off with a trip to the ER when Dar had kidney stones that presented like they might be appendicitis, or what she described as ‘an alien living inside’ of her (good thing that proved to be a misdiagnosis). 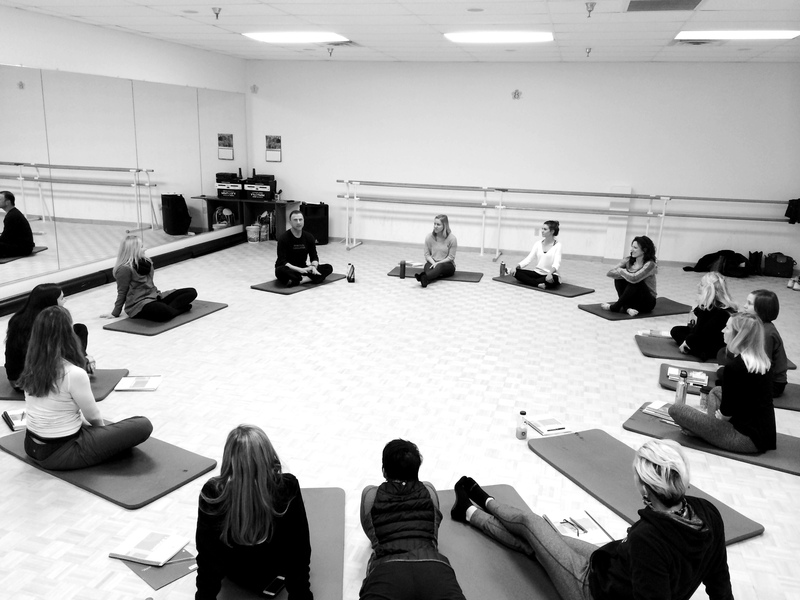 The week ended (and the new one began) with the most intensive 5 day certification I’ve ever been to with our unbelievable team for the barre portion of our new studio concept in Charlottesville (b:core methods). We were all trained by Exhale/Core Fusion co-founder Fred DeVito (who basically established Barre in the US with the Lotte Berk Method before creating Core Fusion — you’re welcome America), and it could not have been more exceptional. I will be sharing a far more extensive history of the method, updates from the weekend and my recap of the experience in the next week or so, but in short, it was better than I could have hoped for from an truly educational, and functionally sound perspective. Our teachers were all amazing right from the beginning, not only getting right into teaching like rock stars (seriously, all of them. rock stars) but also in how they embraced and dug into the kinesiology and anatomy sections, which was the most important part to Dar and I. Everyone got two manuals, one for the method and class structure (etc.) and a second THICK manual detailing out the ‘why’ behind each nuance, movement, and modification that has been developed and improved in line with physical therapists, professors, and doctors of varying specialties. Twenty years of expertise, evolution, and technique all wrapped up into 5 long days of intensives. It’s now four days later and I’m still applying new tidbits not only to how I think about barre on the whole, but also how I think about coaching and performing at MADabolic — and it’s already made a huge difference. When I haven’t been at this training, at MAD, or you know, working at my day job, we’ve been (of course) working on another pretty exciting collaboration (or three) with some folks locally, and I can’t wait to announce all of them in the next month or so. Lots of amazing things are about to unleash themselves in Charlottesville, and a few other choice locations. I guess when it rains it pours, and that doesn’t have to be a bad thing. Through all of the scurrying, training, and building, one thing has remained constant: good food. We’ve been lucky to have the time and ability to stay in Cville rather than having to travel for training, and through that have had some amazing meals both at home and with friends. 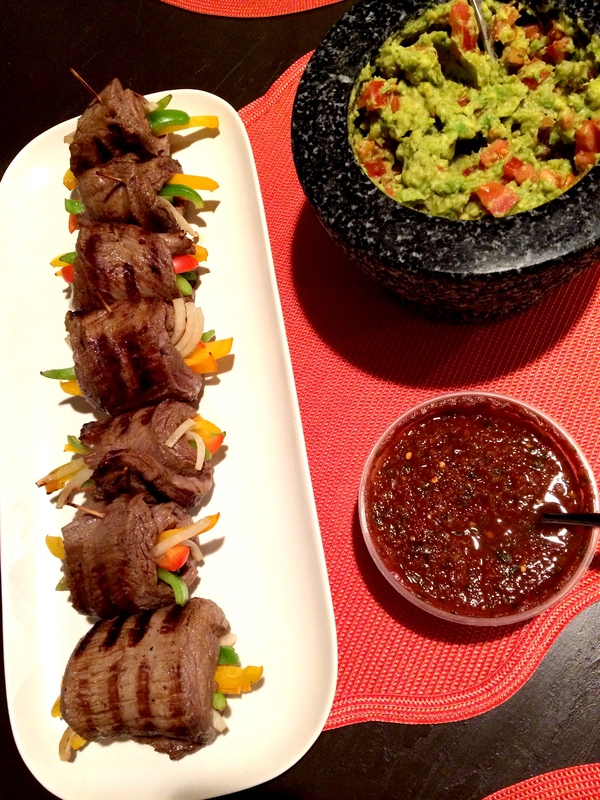 Grilled Flank Steak Fajita Wraps w/ fresh guacamole, that I believe may have been an offspring of this recipe from Paleo Kitchen, and happened to also be paired with the most amazing mexican cauliflower rice thanks to two of our awesome MAD members. This soup was a hybrid product, existing somewhere between the Whole Food’s Turkey Chili made paleo that Todd and Kiks made a few weeks ago, a general vegetable soup, and a basic dump in of everything left in the fridge. 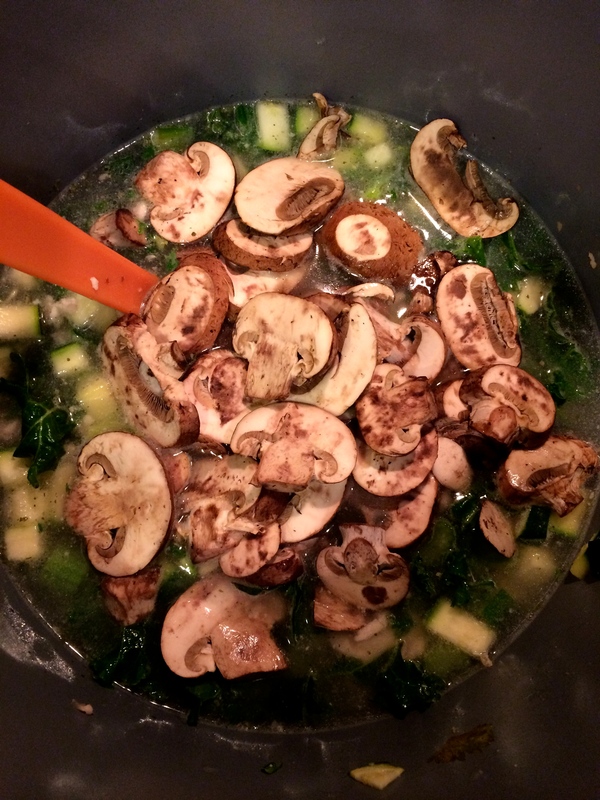 Here’s what we had: sautéd onion with ground turkey, zucchini and yellow squash, kale, chicken stock, and mushrooms added to the boil. The only spices added were garlic salt (from the grinder) and black pepper — and that’s all that it needed. 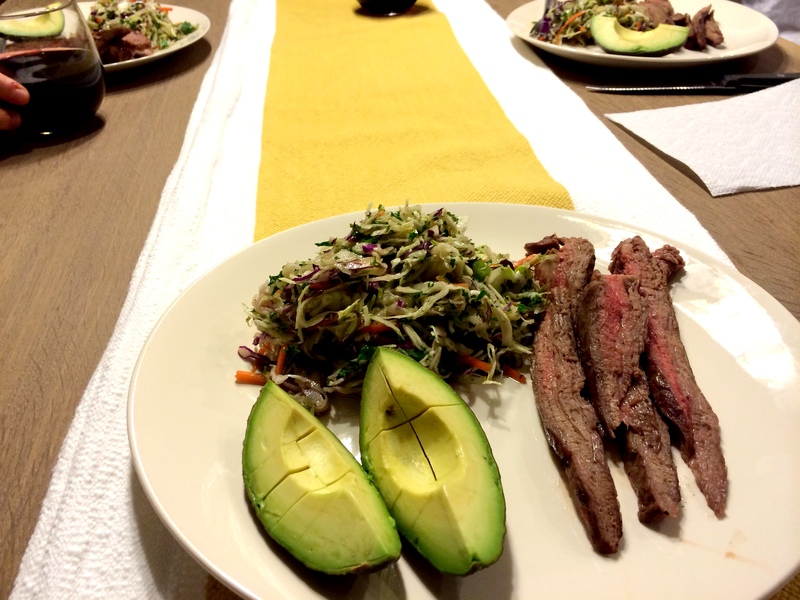 Monday night, at the end of our final training day, I decompressed with one of my favorite staple meals; flank steak, calciferous kale and green onion slaw (dressed in lime juice, olive oil + sea salt) with a side of avocado. 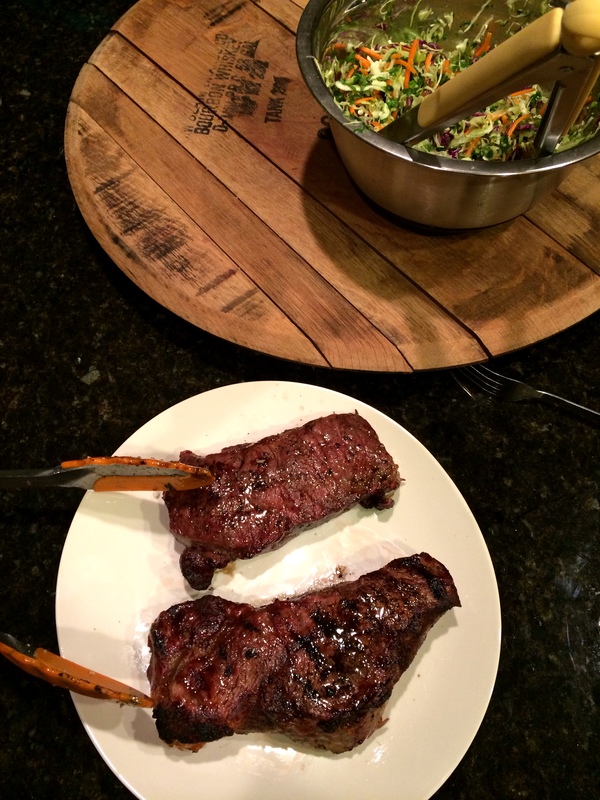 This is definitely one of my favorite meal combo’s and have had it in several different iterations over the last few weeks, including last night again when we had two of our MADmen over for dinner + development. This weekend I’m looking forward to laying low, and I actually head to Charlotte on Sunday night for most of next week, but as we all know, a week in my office in charlotte = a full weekend day prepping meals and making sure I’m fully stocked for a week of work life imbalance.